community. We hold monthly meetings, which are dues-free and open to everyone, participate in the annual Merging Visions Exhibit that pairs local artists with local poets to create a free display at the public libraries, and support the encouragement of budding poets through our new annual Debra S. Davis Poetry Contest. banners and boxes around this website (there is one at the top of the home page, for example), a percentage of all purchases that you make during that shopping session at Amazon goes to fund the Denton Poets’ Assembly. It really is that simple. One extra click for you. Your shopping session will remain unchanged (you can still buy any and all items available on Amazon.com), you will still checkout as usual, and you spend no extra money. You can also do your shopping directly at our Amazon Store. It’s the same idea – except DPA gets a slightly larger percentage of the total purchase. 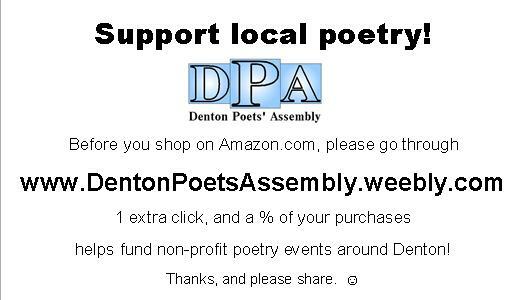 *Note: The Denton Poets’ Assembly cannot see who purchased items, credit card information, or any other personal details of the purchaser. All we see is the cost, and the percentage that goes to our organization. You can also make donations directly to the organization. Please see our Contact page to get in touch with our president. Several DPA members have work published – some in full books, some in chapbooks, and some as individual poems in larger collections. If you’d like to see an ever-growing list of some of DPA’s member publications, check out our Members Bookshelf. Don’t forget to purchase through our Amazon Store (or banners)! Click below to download flyers, posters, and cardlets for DPA. Feel free to print off as many as you'd like to hand out to friends, post at favorite hang-outs, etc. Note: Be sure to ask vendors if posting is okay before doing so!